Since I adopted a more plant-based lifestyle, I’ve had to go right back to basics with my baking. Believe me, there have been some absolute disasters, so bad even my sweet-toothed cat Fred wouldn’t bother with them! 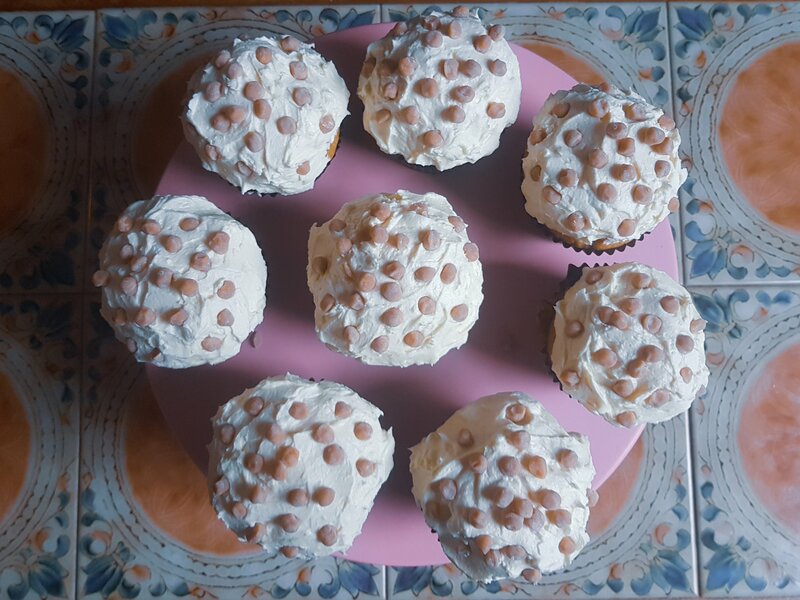 I’ve been hunting for the perfect vegan vanilla cupcakes recipe for ages – I got into baking years ago because of a huge love affair with the beautiful little treats – but the ones I made didn’t come out well. Heavy doughy bases, or grainy oily frosting; sometimes the cupcakes wouldn’t rise at all, sometimes they would explode but never cook off! Some of the recipes called for ridiculous ingredients that I had to scour the aisles of health food shops for, ingredients that cost a fortune and tasted vile. Would I ever eat an edible cupcake again? After tinkering and tasting, mixing and measuring, plus a whole lot of muttering to myself and imploring the baking gods…… I struck gold! Or should I say light, fluffy yellow? The perfect Vegan Vanilla Cupcakes Recipe. A beautifully soft vanilla flavoured cupcake topped with rich – but not heavy – vanilla frosting, well risen and perfectly edible with no ridiculous ingredients and no hefty price tag. The Holy Grail of cupcakes, from which I can make most other flavours, has been found. And it’s so absurdly easy, even my kids could make them while staring at their phones and shouting at each other! Preheat your oven to 180c and move your shelf to the middle. Place all your dry ingredients in a large mixing bowl and using a fork or a whisk, mix together thoroughly then set aside. In a separate bowl or jug mix together your plant milk, oil, vanilla extract and vinegar – you need to keep stirring it until it begins to thicken up, this is going to act as the “egg” in your cakes. Once thickened up, slowly and thoroughly whisk the wet mixture into the dry. Make sure you have no clumps of flour left – ain’t nobody got time for that! Quickly portion the batter into your prepared cases, pop in the oven and bake for about 15-20 mins (depends on your oven, mine either incinerates everything or leaves it raw) until well risen and slightly golden, and they pass the skewer test. Let them cool in the tin for a few minutes, then place on a cooling rack and leave to go completely cold. Now it’s elbow grease time – unless you have an electric mixer like me – so roll up your sleeves and flex! In a large bowl, beat the margarine and vegetable shortening until it is soft and completely combined. Next; using a sieve, sift a quarter of your icing sugar into the bowl then thoroughly beat it in. Keep repeating this process, but add the vanilla extract with the last dose of icing sugar. Check the consistency – if it’s too runny you can add more sugar, if it’s too hard add a tiny splash of plant milk – making sure it’s firm but soft and fluffy. Nobody likes tough frosting! If you want to, you can add food colouring to jazz it up, or even lightly fold in some sprinkles. Whatever, go nuts…. oh nuts would work too haha! If you have one/want to/know how to use a piping bag to decorate the tops of your cold cupcakes. They will have a hefty amount of frosting! Then finish off with any decorations you fancy – I used vegan salted caramel chunks for mine and they were AWESOME. Once I got this basic vanilla version down, my vegan cupcake game was on fire! You can mix it up, adding different flavourings and additions to make your cupcake dreams a reality. I’m currently fantasizing about an Oreo chocolate version with an actual Oreo baked in, and chunks of the biscuit through the topping That sounds blooming orgasmic to me! Do let me know if you decide to make your own; I’d love to hear what you think, and what inspiring variations you manage to concoct! Cupcakes are LIFE. I think “cupcake” may be my very favorite C word! I don’t think we have caster sugar here, though. Thanks for the eye candy! You could just use regular sugar! Do have a go if you can, you won’t be disappointed. Cupcakes Forever! Honestly honey, these are so easy to make anybody could do it!